I didn’t realize how little I knew about South Africa until I started to wander down the coast between the Garden Route and the Wild Coast. What I found wasn’t the Big 5 Safaris you see in all the brochures, although it was nature I was finding. 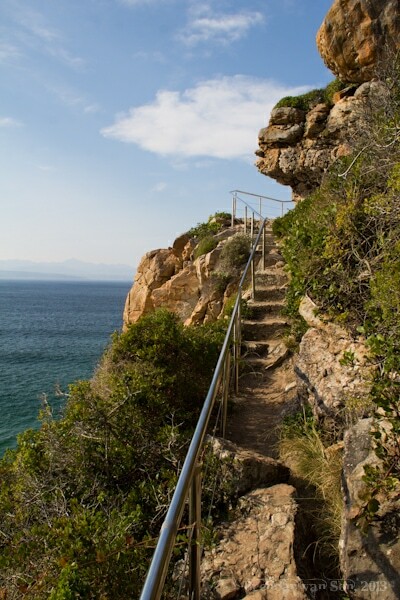 The system of national parks in South Africa goes well beyond the big ones advertised internationally, and one of my favourites was Robberg Nature Reserve just outside of the town of Plettenberg Bay. I wandered out on to this windy peninsula in search of Cape Fur Seals, which are apparently harder to find than I am capable of searching. But even though I missed out on spotting them, I did find a natural setting that really is out of this world. 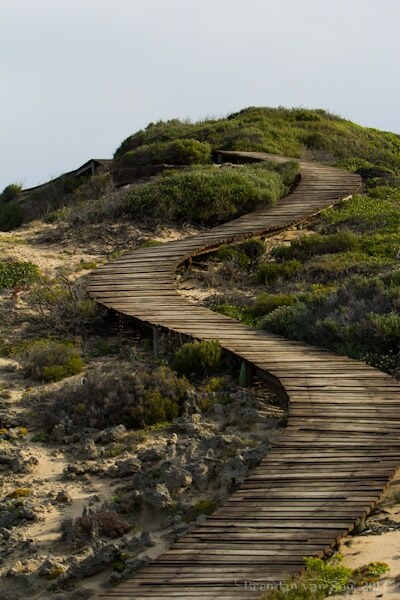 Robberg Nature Reserve is a windswept chunk of land which stretches into the Indian Ocean, and seems to hold a dozen different ecosystems all within walking distance from each other. At first, the trail is craggy and hugs along a steep cliff wall to which bright green brush hang desperately. The ground is made up of hard rock, but somehow a wealth of flowers seem to spring from its every crack. This side of the reserve is featured by serious winds, and might not be for the faint of heart. The trail leads up a steep incline and over a crest in the hill. Out of nowhere, the ground gives way to a strip of perfect sand which splits the peninsula in two. I follow the sand down towards the sea below. A couple points of green covered rock stick out to the sea protecting a wide stretch of beautiful sandy beach upon which wild and rugged waves tumble. On the beach, oyster catchers play catch with the tides and race away from oncoming waters. The water is tropical and so perfect you can’t help but dip your toes, yet rugged enough it still feels dangerous and adventurous. The trail back to the park entrance takes me up and over rocky outcrops and past tide pools. 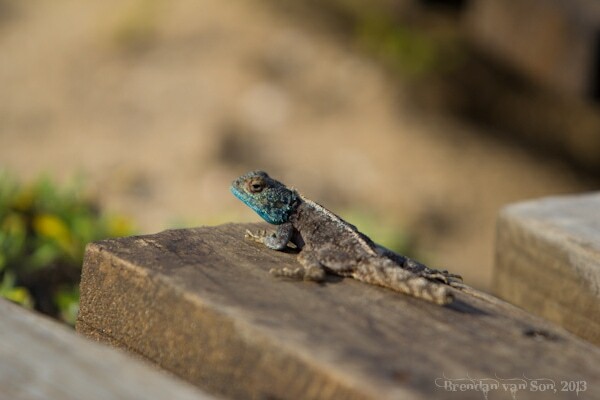 Along the boardwalks, shy lizards race away from my thundering steps. They look like they’ve been painted blue by the sea. Again, I’m blown away by the way that South Africa has surprised me. 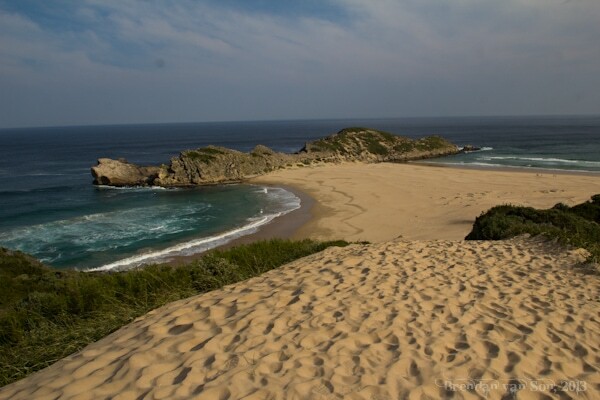 I didn’t ever expect to stumble upon a place like Robberg Nature Reserve, but yet it has been the perfect natural escape. In many ways, this part of South Africa that I’m discovering reminds me a lot of another part of world I love, Vancouver Island. Such wild and rugged unspoiled nature just isn’t something I associated with this part of the world. 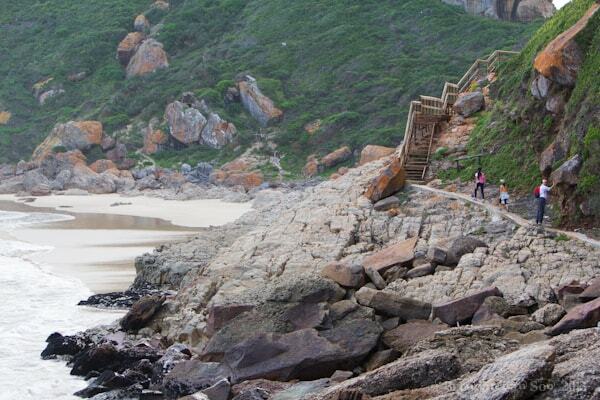 The walk along the wild coast within the nature reserve. But I guess that’s why we travel, to make our own judgement, and create our own impressions. For me, it’s not those big safaris that make South Africa unique, it’s this perfect slice of nature that coats the coastline from Namibia all the way to Mozambique. I found that on the few travels we did as a family the best places are the ones not found in brochures. I mean the wifey prefers the safer tourism spots but the path less traveled are usually the better ones in my opinion. Thats one nice looking beach.